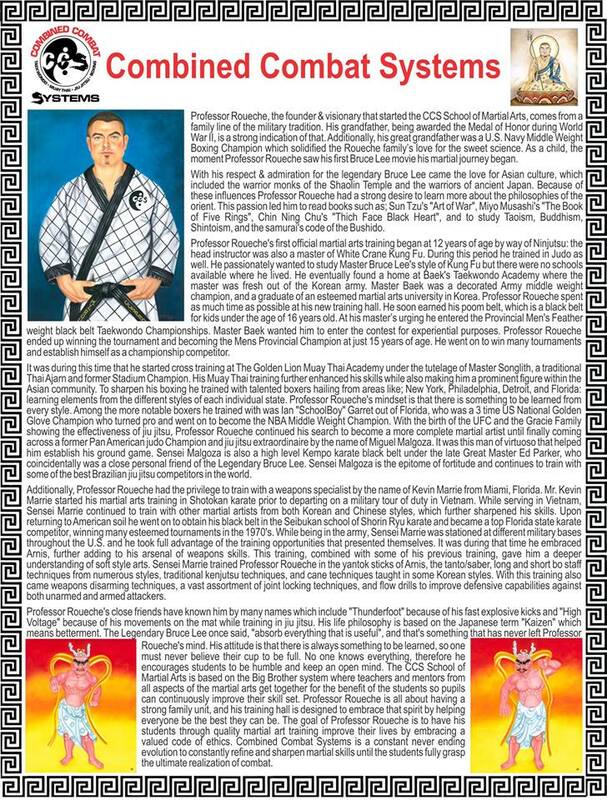 Someone has posted an interesting write up about a system of martial arts that Clay Roueche has created called Combined Combat System on a public Facebook account set up to promote his Book of Indomitable Virtues. We all knew that Clay had a black belt in Taekwondo. Yet I had no idea about the extent of his MMA background. In addition to that he has been able to train with some impressive boxers and martial artists in prison after he got out of solitary. Professor Roueche, the founder & visionary that started the CCS School of Martial Arts, comes from a family line of the military tradition. His grandfather, being awarded the Medal of Honor during World War II, is a strong indication of that. Additionally, his great grandfather was a U.S. Navy Middle Weight Boxing Champion which solidified the Roueche family's love for the sweet science. As a child, the moment Professor Roueche saw his first Bruce Lee movie his martial journey began. With his respect & admiration for the legendary Bruce Lee came the love for Asian culture, which included the warrior monks of the Shaolin Temple and the warriors of ancient Japan. Because of these influences Professor Roueche had a strong desire to learn more about the philosophies of the orient. This passion led him to read books such as; Sun Tzu's "Art of War", Miyo Musashi's "The Book of Five Rings", Chin Ning Chu's "Thich Face Black Heart", and to study; Taoism, Buddhism, Shintoism, and the samurai's code of the Bushido. Professor Roueche's first official martial arts training began at 12 years of age by way of Ninjutsu: the head instructor was also a master of White Crane Kung Fu. During this period he trained in Judo as well. He passionately wanted to study Master Bruce Lee's style of Kung Fu but there were no schools available where he lived. He eventually found a home at Baek's Taekwondo Academy where the master was fresh out of the Korean army. Master Baek was a decorated Army middle weight champion, and a graduate of an esteemed martial arts university in Korea. Professor Roueche spent as much time as possible at his new training hall. He soon earned his poom belt, which is a black belt for kids under the age of 16 years old. At his masters urging he entered the Provincial Men's Feather weight black belt Taekwondo Championships. Master Baek wanted him to enter the contest for experiential purposes. Professor Roueche ended up winning the tournament and becoming the Mens Provincial Champion at just 15 years of age. He went on to win many tournaments and establish himself as a championship competitor. It was during this time that he started cross training at The Golden Lion Muay Thai Academy under the tutelage of Master Songlith a traditional Thai Ajarn and former Stadium Champion. His Muay Thai training further enhanced his skills while also making him a prominent figure within the Asian community. To sharpen his boxing he trained with talented boxers hailing from areas like; New York, Philadelphia, Detroit, and Florida: learning elements from the different styles of each individual state. Professor Roueche's mindset is that there is something to be learned from every style. Among the more notable boxer's he trained with was Ian "SchoolBoy" Garret out of Florida, who was a 3 time US National Golden Glove Champion that turned pro and went on to become the NBA Middle Weight Champion. With the birth of the UFC and the Gracie Family showing the effectiveness of jiu jitsu, Professor Roueche continued his search to become a more complete martial artist until finally coming across a former Pan American judo Champion and jiu jitsu extraordinaire by the name of Miguel Malgoza, it was this man of virtuoso that helped him establish his ground game. Sensei Malgoza is also a high level Kempo karate black belt under the late Great Master Ed Parker, who coincidentally was a close personal friend of the Legendary Bruce Lee. Sensei Malgoza is the epitome of fortitude and continues to train with some of the best Brazilian jiu jitsu competitors in the world. Additionally, Professor Roueche had the privilege to train with a weapons specialist by the name of Kevin Marrie from Miami Florida. Mr. Kevin Marrie, started his martial arts training in Shotokan karate prior to departing on a military tour of duty in Vietnam. While serving in Vietnam Sensei Marrie continued to train with other martial artists from both Korean and Chinese styles, which further sharpened his skills. Upon returning to American soil he went on to obtain his black belt in the Seibukan school of Shorin Ryu karate and became a top Florida state karate competitor winning many esteemed tournaments in the 1970's. While being in the army Sensei Marrie was stationed at different military bases throughout the U.S. and he took full advantage of the training opportunities that presented themselves. It was during that time he embraced Arnis further adding to his arsenal of weapons skills. This training combined with some of his previous training gave him a deeper understanding of soft style arts. 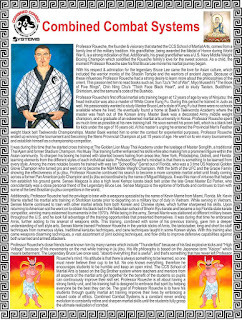 Sensei Marrie trained Professor Roueche in the yantok sticks of Arnis, the tanto/saber, long and short bo staff techniques from numerous styles, traditional kenjutsu techniques, and cane techniques taught in some Korean styles. With this training also came weapons disarming techniques, a vast assortment of joint locking techniques, and flow drills to improve defensive capabilities against both unarmed and armed attackers. Professor Roueche's close friends have known him by many names which include "Thunderfoot" because of his fast explosive kicks and "High Voltage" because of his movements on the mat while training in jiu jitsu. His life philosophy is based on the Japanese term "Kaizen" which means betterment. The Legendary Bruce Lee once said, "absorb everything that is useful", and that's something that has never left Professor Roueche's mind. His attitude is that there is always something to be learned, so one must never believe their cup to be full. No one knows everything, therefore he encourages students to be humble and keep an open mind. The CCS School of Martial Arts is based on the Big Brother system where teachers and mentors from all aspects of the martial arts get together for the benefit of the students so pupils can continuously improve their skill set. Professor Roueche is all about having a strong family unit, and his training hall is designed to embrace that spirit by helping everyone be the best they can be. The goal of Professor Roueche is to have his students through quality martial art training improve their lives by embracing a valued code of ethics. Combined Combat Systems is a constant never ending evolution to constantly refine and sharpen martial skills until the students fully grasp the ultimate realization of combat. Yes. Outside of Universities professor just means teacher like Sensei or Sifu. In context of the Martial arts it would mean teacher of highest rank like Grandmaster. So when's Clay being transferred back to a Canadian prison ?????? The cost of not Being A Rat$$$ 30years in America's worst prison like that one in the Middle of Colorado. I haven't heard. I think it's the Canadian authorities that are going out of their way to screw him over. As we saw with Marc Emery, prison transfers are hard to come by but given the illegality of Clay's arrest, I think a prison transfer to Canada is warranted.